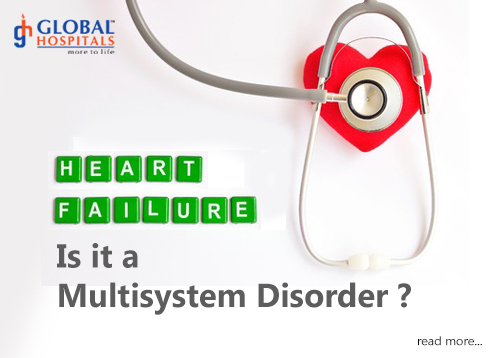 Heart failure develops on multi-factorial background. Both Intrinsic and extrinsic factors account for the ultimate morbidity. The role of gut in chronic heart failure (CHF) has been in focus in recent times and the current research indicates pathophysiological role these gut microbial world to the Heart failure. From a new study published in JACC: ‘Heart Failure, have suggested that patients with CHF are likely to have "intestinal overgrowth" of pathogenic gut flora and permeability that is associated with disease severity. Patients with CHF were found to have pathogenic bacteria and candida in huge numbers as compared against healthy controls. The specific types of the increased pathogens found in stool samples included Campylobacter, Shigella, Salmonella, Yersinia enterocolitica, and Candidaspecies. Those with CHF also had significantly increased inflammation, intestinal permeability, and right atrial pressure (RAP), which is a signal of venous blood congestion. And most of these associations were stronger in those with moderate-severe HF (NYHA 3-4) vs those with mild HF (NYHA 1-2)’Lead author, Dr Evasio Pasini (Salvatore Maugeri Foundation, IRCCS, Medical Center of Lumezzane, Brescia, Italy) and co-author suggest that gut microbiota need to be continually investigated as soon as CHF is diagnosed. Using simple, noninvasive, reproducible methods to measure gut-flora development could provide "important clinical information to treat complicated multiorgan syndromes." More than 100 species of microbes are stated to home in our gut. These are bacteria of benefit that help in digestion, prevent blood clotting, produce Vitamin B, immunity etc. Advocacy of consumption of fermented foods is only to enhance and stabilize useful bacteria. GUT disturbances producing unrelated disorders are not unknown to Ayurveda. The GUT microbial environment is reflection of our foods and food habits. Any deviation in consumption of balanced food, I mean from Microbial safety point of view, would result in both Human physical and psychological imbalance. Many are not cognizant of this vital issue. Modern medical research has unraveled the mystery that gut bacterial alteration would produce variety of disorders such as arthritis, urticaria, depression, anxiety so on. Physicians prescribe medicine for the symptoms ignoring the root cause, possibly many professionals are unaware or do not take cognizance of its relevance. Every human being is governed by food, followed by actions and finally thoughts. The interrelationship is sensitive and not very obvious. Our beliefs are nurtured by habits including Food. It is said ‘ Our Beliefs become or thoughts, Our thoughts become our actions and our actions become our Habits and our habits determine our Character. I feel even the disease character is decided by GUT. !.